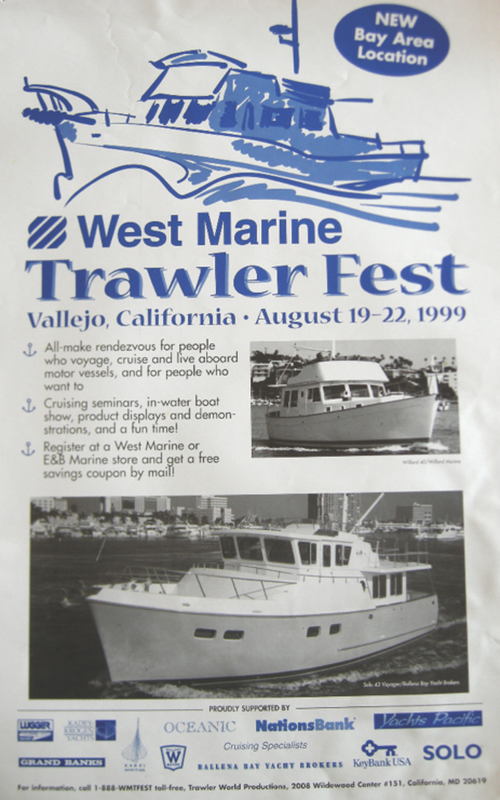 2015 marks the 10th anniversary of TrawlerFest under the PassageMaker banner, but the event started nine years earlier as the West Marine Trawler Fest series soon after the magazine was launched in 1995. TrawlerFest&apos;s first advert, appropriately appearing in the pages of PassageMaker. I was so enthralled with reading about his boat and the prospect of crossing oceans under power that I hadn’t paid attention to his name. He was Bruce Kessler. And, with his wife, Joan, Bruce had circumnavigated the world aboard Zopilote, that majestic green motoryacht that started me—and many other sailors—thinking about cruising and voyaging under power. 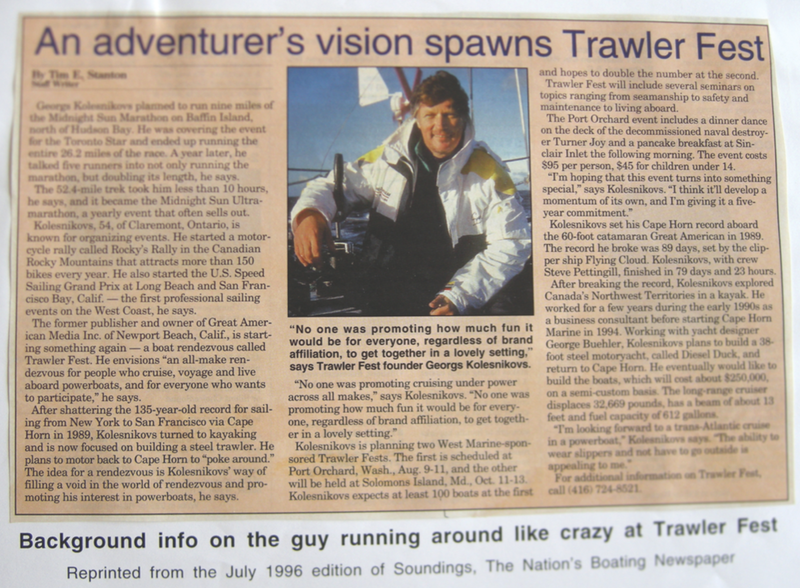 His circumnavigation in 1990-93 signaled the start of the recreational trawler era as we know it today. The first circumnavigation in a production powerboat—the voyage of Jim and Susy Sink in the Nordhavn 46 Salvation II in 1990-95—demonstrated what was possible in a small, modern-day trawler yacht. Together, the Kesslers and the Sinks birthed the trawler phenomenon that lead to the magazine you’re reading and the events you’ve most likely attended. 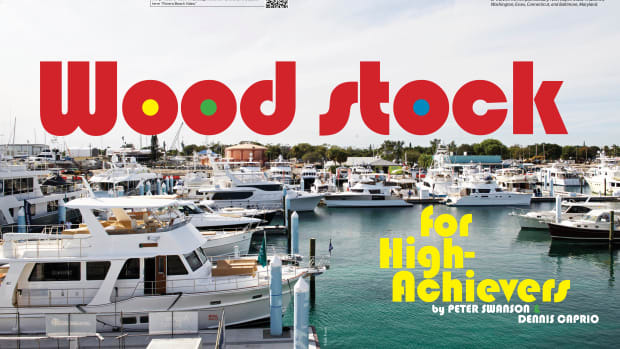 The appearance of Robert Beebe’s classic, Voyaging Under Power, as revised by Jim Leishman of Nordhavn fame, helped fuel the growing interest in trawler yachts. I first learned about Zopilote and saw the first advertisement for the Nordhavn 46 when I lived in Yellowknife in Canada’s Northwest Territories and was publisher of Up Here magazine. 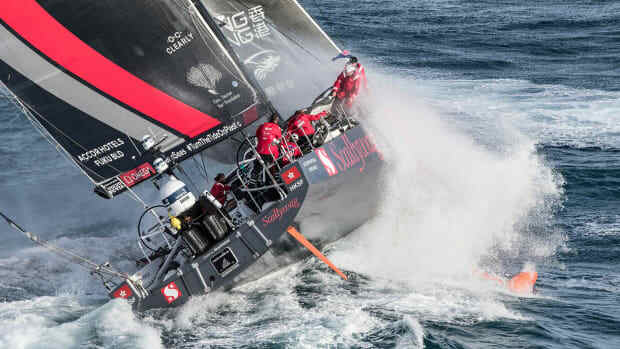 I had sold Great American, the ocean-racing trimaran with which I had set the New York-San Francisco sailing record around Cape Horn, and left California for Yellowknife to live out a boyhood dream. I wanted to leave boating behind, but those photos of Zopilote in the South Pacific and that ad for Nordhavn would not let me be. I wrote away for information from Pacific Asian Enterprises and started looking for boat shows where I could see these wonderful trawlers. If you can remember the early 1990s, there were few trawlers to be seen at the mainstream boat shows. 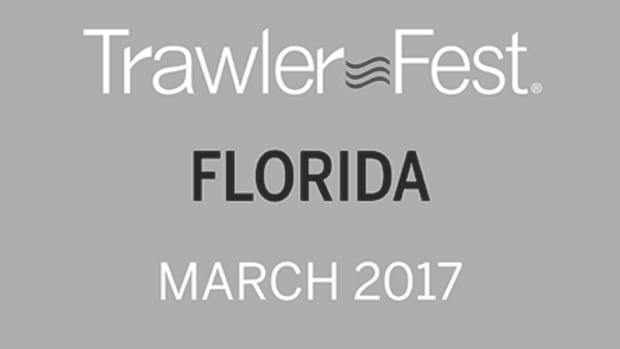 TrawlerFest founder Georgs Kolesnikovs has hosted the popular online Trawlers & Trawlering forum since 1997. By 1994, I was itching to see Nordhavns and Krogens, as well as Grand Banks and Marine Traders, together in one place so I could climb aboard, look them over in the flesh and start making decisions. Soon, I lost patience. If there was no show that featured trawlers, I would organize one that did! 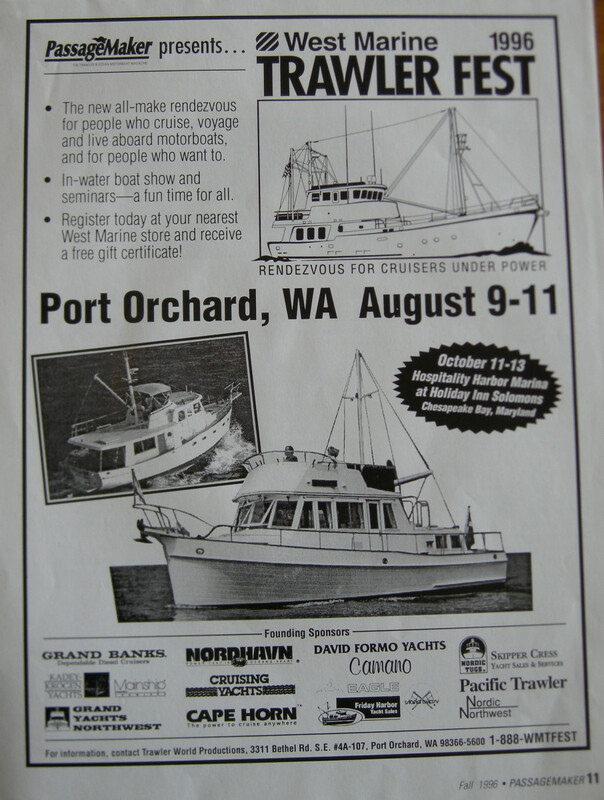 During the of West Marine’s involvement, Poulsbo, Washington, was TrawlerFest’s Pacific Northwest locale. For most of the Eighties, I owned and operated The Great American Motorcycle Shows in major markets across the U.S., thus, event management wasn’t new territory for me. There were no online boating forums then, the Internet was just starting to enter the public consciousness, but there was Sailing Forum on CompuServe. It was there that I first floated the concept for TrawlerFest, initially much more of a rendezvous than a show. I figured it was as important to meet owners of trawlers and learn from their experience as it was to see the boats. 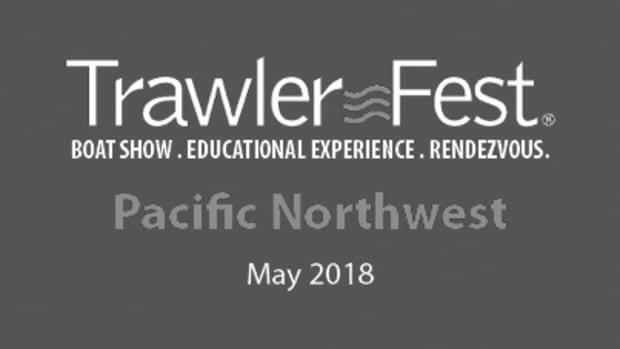 TrawlerFest will be a rendezvous, an in-water boat show, a cruising academy of seminars and workshops, social activities, a weekend of fun on the water. It will be a unique new event open to all makes of motorboats and the people who voyage, cruise and live aboard them, and the people who want to. Sailors who had recently transitioned to power, or were about to, were instantly enthusiastic. One of the first to respond was Hal Wyman of Seattle who had just acquired a Krogen 54 named Utopia. For a West Coast event, there was only one location that I should consider, he told me, Puget Sound. On the Atlantic side, many suggested Florida but the Chesapeake was the clear winner. Chuck Hawley of West Marine was active on the Sailing Forum. When he expressed enthusiasm for the concept, I emailed to ask for dates of West Marine events to avoid any conflicts. He immediately replied: “Conflicts? 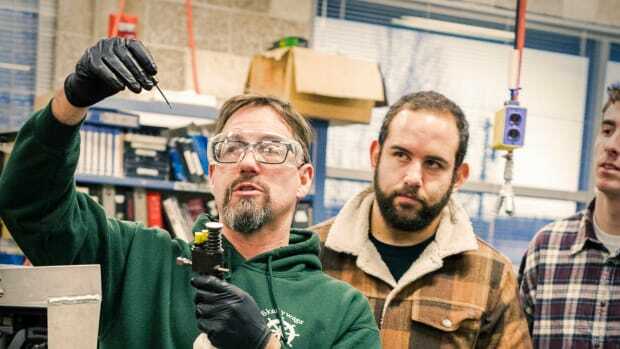 Hell, we want to be involved!” So, West Marine signed on as title sponsor and Hawley became a popular seminar presenter and master of ceremonies at social events. In early 1995, I visited Puget Sound and the Chesapeake, scouting locations, eventually deciding on Port Orchard, Washington, and Solomons, Maryland. While out west, I met George Buehler, then the little-known designer of Diesel Duck and author of this issue’s ShopTalk column. He told me he recently had a visit from a couple I should meet who were thinking about starting a power cruising magazine. And so it came to be that I hooked up with Bill and Laurene Parlatore and PassageMaker became the presenting sponsor. 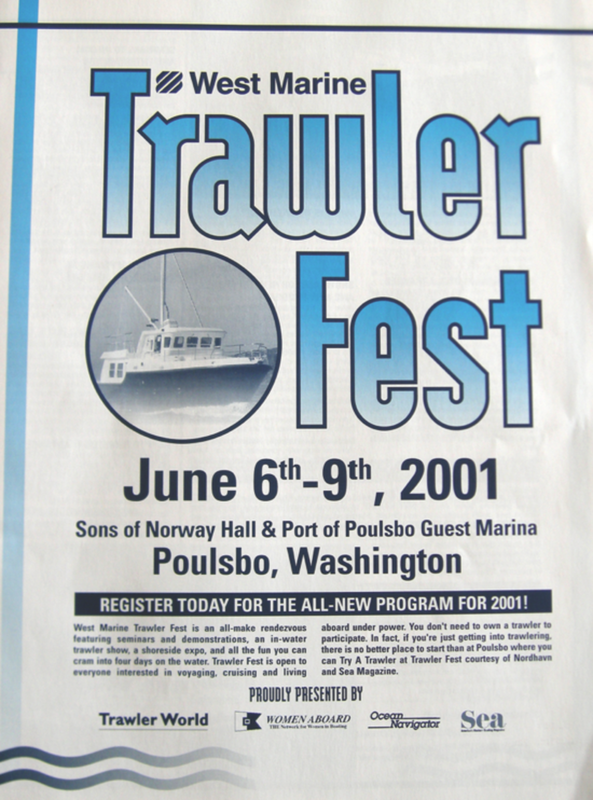 The first TrawlerFest was staged several months after the first edition of the magazine appeared. 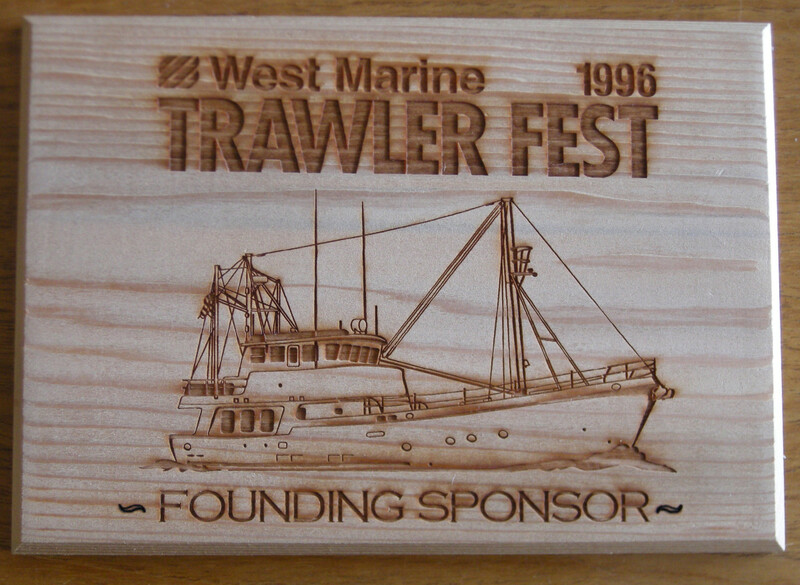 TrawlerFest, when it was known as West Marine Trawler Fest, made its debut on August 9 through 11, 1996, at the municipal marina in Port Orchard, Washington. 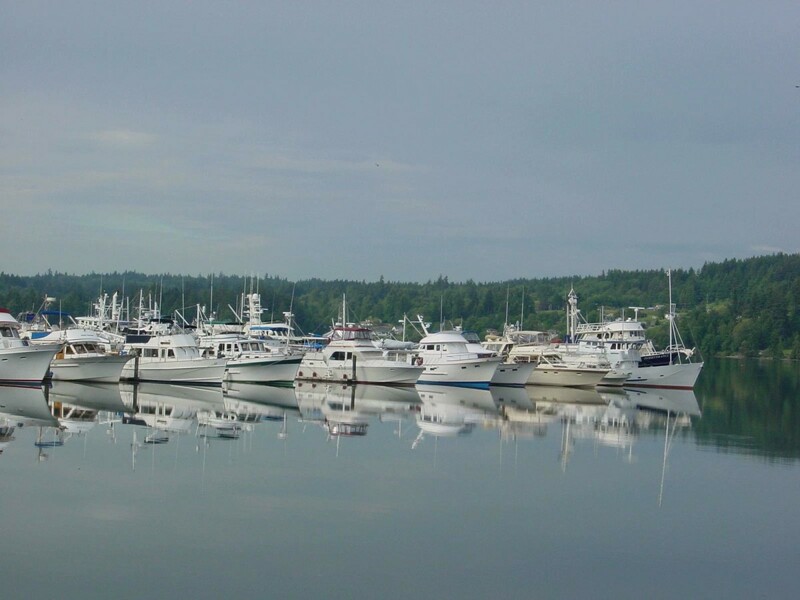 West Marine Trawler Fest in the Chesapeake was launched on October 11 through 13 of the same year at Hospitality Harbor Marina and Spring Cove Marina in Solomons, Maryland. California was the site for TrawlerFests before and during PassageMaker’s ownership. It may well return there. I invited Jim and Susy Sink, recently returned from their six-year, 50,000-mile circumnavigation aboard Salvation II, to be the guests of honor. The slide presentation of their adventure was one of the highlights of the first two TrawlerFests. A personal highlight was that I was able introduce the Sinks as the Trawler World Passagemakers of the Year (after the TrawlerWorld.com website I had started, which lives on today as TrawlersAndTrawlering.com). Jim and Susy ran Salvation II to Port Orchard from Dana Point, California, nonstop in eight days. Seeing the Nordhavn at the end of dock, with flags of the 51 countries visited fluttering in the breeze, was a thrill for all 185 trawler enthusiasts who attended the inaugural event. Thirty-five yachts were open for viewing, including one named Passagemaker, a 47-foot C&L Alexander PH owned by Jerry and Pam Munson. Coming full circle at the most recent TrawlerFest in Baltimore, it was cool to see another Nordhavn 46 on the guest dock, Egret, with which Scott and Mary Flanders circumnavigated via the five great capes from2006 to 2011. It was also way cool to see Bruce Kessler as a seminar presenter. To the first TrawlerFests in 1996 I also invited Bryan Peterson, who circumnavigated in Sunrider, a 24-foot Zodiac semi-rigid inflatable powered by biodiesel fuel—becoming the smallest motorized vessel ever to complete such a voyage. He brought Sunrider to the events on a trailer. From the first TrawlerFest in Port Orchard, with 35 boats and 185 people, to Solomons, with 45 boats and 320 people, the series grew rapidly, expanding to Texas, California (San Francisco and Long Beach) and the Great Lakes by 2002 when I passed the torch to return to my great love, magazines. Solomons and Fort Myers were the largest events, with more than 100 boats and close to 2,000 people taking part. 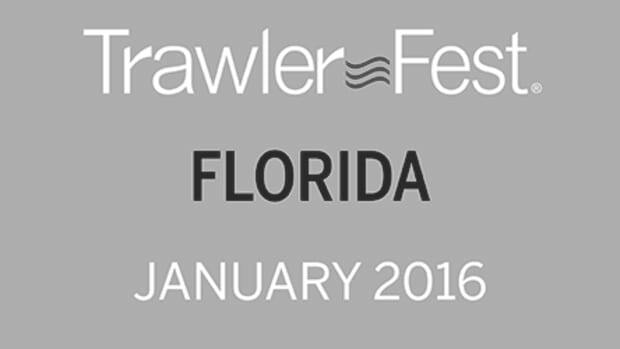 In all, a total 4,000 participants at all venues made TrawlerFest the largest event sponsored by West Marine. One feature of the early TrawlerFests that could not be continued as the events grew and morphed from a rendezvous into a show was the popular TrawlerFest Trawler Crawl where owners of private vessels opened them to visitors. Each TrawlerFest featured a special Saturday evening social program unique to that location. In Puget Sound, it was a banquet of halibut and prime rib. At Solomons, there was a Chesapeake crab feast in a huge tent—bushels of steamed crabs dumped on tables where guests were equipped with plates, paper towels and mallets. An open bar helped lubricate festivities. The rising price of crabs encountered a slumping economy and the feasts unfortunately had to end. At the final crab feast, some 800 trawler-crawlers enjoyed a most memorable evening under the TrawlerFest big top at Calvert Marina. Put that many kindred spirits in one place at one time and the buzz in the air is palpable—a clear memory years later. TrawlerFests attracted industry support right from the get-go. 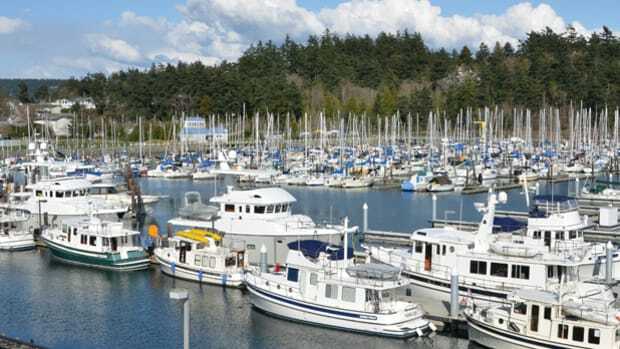 Camano, Eagle, Endevour Catamarans, Grand Banks, Great Harbour, Island Gypsy, Kadey-Krogen, Mainship, Nordhavn, Nordic Tugs, Pacific Trawler and Seahorse Marine showed boats to consumers eager to buy into the trawler lifestyle. In addition to West Marine, inaugural sponsors and exhibitors included Naiad Marine Systems, SoyGold Marine and Alaska Diesel Electric/Northern Lights. High-caliber seminar presenters included cruising-guide-writers Skipper Bob, Claiborne Young and Fred Myers; Bob Smith of Lehman Ford; Ron and Eva Stob, founders of America’s Great Loop Cruisers’ Association; Nordhavn’s Jim Leishman, yacht designers Steve Seaton and Jay Benford, Maria Russell of Women Aboard, Capt’n Wil Andrews, and the list goes on. 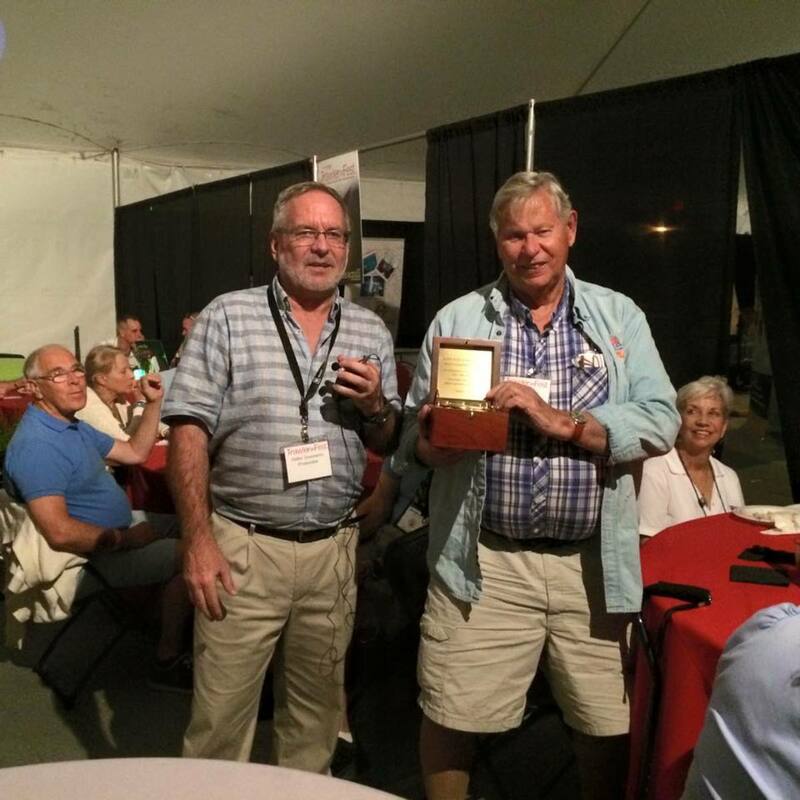 Bob Smith (right) was recently saluted at TrawlerFest-Riviera Beach for attending every TrawlerFest to date. Trawler folk showed up at the dock with their boats, wanting to share their knowledge and experiences. One such couple was Mark and Susanne Richter. 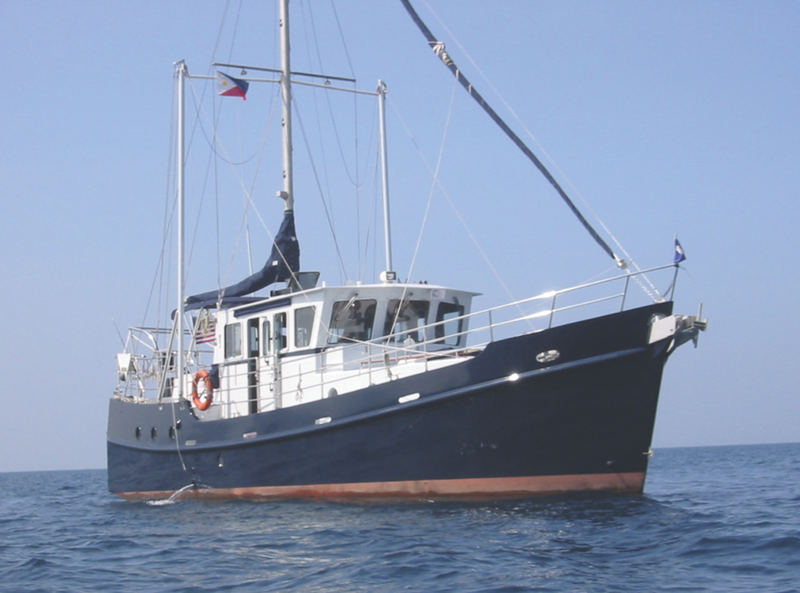 They were in the midst of converting a Morgan 45 sailboat hull into a unique trawler when they heard about the first Solomons TrawlerFest. They vowed to finish the project by the second edition—and just made it, running up the Intracoastal Waterway from Orange City, Florida, in 14 days right after launching Winnie the Pooh. Mark became a popular seminar presenter for many years. TrawlerFest’s immediate success attracted couples eager to work for a little more than peanuts to help make the events happen. Tom and Ann Caywood, Dennis and Esther Bruckel, Ted and Dee Kermode, and Jack and Millie Rose worked hard and loved it as “event staff.” Nanette Jacques, with whom I had worked in motorcycle magazines in the 1970s, handled sponsorship and exhibitor sales. Norlene, my girlfriend, now wife, was a huge help in immeasurable ways. In those early years, the tremendous effort to produce TrawlerFest was made more than worthwhile by the wonderful impact it had on so many lives. As a result of the experience—the boats, people, seminars and camaraderie—countless couples have been inspired to purchase a boat and adopt a new lifestyle that comes with voyaging under power, cruising and living aboard. That was true in 1996, and it’s true today.